« Who can Spring Clean my Yard? When a tree is removed you will be left with what is called the stump. Even though you are glad the tree is removed the stump and the root system could still cause a problem. Whilst the stump is still protruding out of the ground certain activities will still need to be done around the stump like mowing the lawn. Not to mention the added pests that will source a home in your remaining tree stump. Stumps can sometimes be left in the most inconvenient of places if your stump is in the location of a garden bed, it will be difficult to grow new vegetation and plant life in the spot until the stump and all is removed. We can trim and remove any loose or low hanging branches and make your tree look more presentable. If your trees have been broken and destroyed by bad weather and unfortunately can’t stay where they are any more the whole tree may need to be removed down to the stump. When tree branches are not maintained by keeping them tidy they can pose an electrical hazard when interfering with powerlines which could promote a fire. If this can’t be maintained, it would be a good idea to get the tree removed for the future safety. 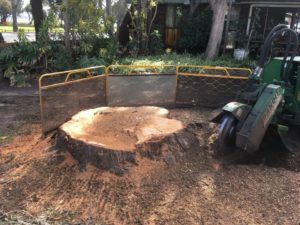 Even when the tree has been cut to a stump the process to create the yard space will only best be achieved when the complete stump has been removed. 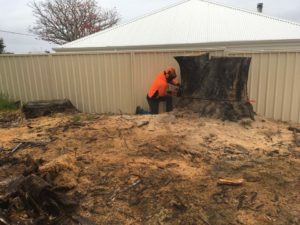 Armac Stump Grinding, Tree Removal and Yard cleanup are the professionals when it comes to all your stump grinding, tree removals and earthworks. Servicing areas of Collie, Harvey, Capel, Brunswick, Bunbury, Eaton and Australind. Contact Ray today on 0448 442 477. Is It Better to Grind A Stump or Remove It? How Deep Can You Stump Grind? Signs a Tree is About to Fall? COPYRIGHT © 2019, ARMAC BUNBURY, ALL RIGHT RESERVED.